On 4th August 1978, Langwith colliery (North Derbyshire) sunk 1876-1880 by the Sheepbridge Coal and Iron Co, located at Whaley Thorns, north of Nether Langwith was closed after 99 years. The pit was referred to as the ‘jewel in the crown’ for Sheepbridge Coal and Iron Co. 2,440 acres of land and rights to work coal was purchased to the west of Whaley village from Earl of Bathurst. The site was chosen because of its proximity to Langwith station from which the pit got its name and water was easily obtainable from the River Poulter nearby for use in the boilers. 152 miners’ cottages were built to the north east of the mine site. Land was given so that the miners and families could enjoy sport and recreation such as football, cricket, bowls and tennis etc. A village Welfare and Institute was opened in 1883. 45 acres of land was set aside for allotments leased from the Duke of Portland. Due to the brittleness of the coal a plant was set up in 1908 to use the slack made, to make chemicals, ammonia and tar. It was said that the Earl of Bathurst insisted that care was taken at the plant to ensure as little damage as possible be done to the environment by preventing the fumes etc spreading and effluent polluting the river. Electricity was introduced underground in 1920 for coal production but had been used on a limited scale for pumping since 1899. In 1947 an electric generator was commissioned supplying electricity to the village. A McLane conical tip was used to dispose of waste in the 1940s -1950s. Steam winders were used to raise the coal and transport men and materials. 2 brick chimneys, one for each set of boilers for each winder dominated the skyline, one being dismantled around 1935 when the boiler system of 2 Cornish boilers for pit top heating and 18 Lancashire boilers for winding was served by one chimney, this one being knocked down in 1966 when the winding was converted to electric. No1 shaft 43/5270/915692, 14’ 0” (4.26m) dia, surface level 285’ 0” (87m) started sinking Tuesday 14th March 1876 with a small engine to about 30 yards (28m), then from 1st August 1876 with a large winding engine and reached the Top Hard seam on Saturday 9th February 1878, later deepened about 10 yards (9m) from 5th April to 1st May 1880 to 565 yds (516.6m). No2 shaft began sinking on Tuesday 23rd May 1876 and reached the Top Hard on Saturday 1st June 1878. It was 538 yards (492m) deep and 5’ 10” (1.78m) thick with 3’ 7” (1.10m) of it being hard coal. Later No1 shaft was sunk 30 feet (9m) deeper to the Dunsil seam from 5th April to 1st May 1880 to create a sump from which to pump water. The seam at only 1’ 4” (0.40m) it was considered far too thin to work. Cast-iron tubbing was used in both shafts through the water-bearing strata, the Permo Trias measures down to the coal measures being 220’ 6” (67m) thick. Some 32 seams of coal were passed through but many of them only a few inches (cms) thick and unworkable. Shaft position E452915 N370687. A winding engine was purchased from Olivers of Chesterfield for £2,300 in 1879 and the sidings and pithead were completed by this time. Underground locos: 2’ 0” gauge 4 x 0-4-0 DMF HEs 1949. 1st Waterloo head stopped 1934, coal 2’ 6” (0.76m) developed by 1in2 drift down from Top Hard. There was a steep 1in2.9 drift in the High Hazel No2 pit bottom to the Top Hard. The shaft at 429 yards (390m) deep was 14 feet (4.3m) diameter. The 2 shafts were 70 yards (64m) apart. Originally ventilation was effected by a Guibal 40 feet dia fan at 48 revs per minute and two engines, one at the top of the DC shaft and one at top of UC for haulage work underground. Workmen’s trains for men outside the local area were started in 1882, but then stopped, but then a paddy station was built in 1894 to transport the miners nearer to the colliery. Up to 250 pit ponies were in use during the 1920s, larger ones near the pit bottom and on the surface and the smaller ones near to the coal faces. The stables to accommodate the animals were painted green, to look like grass, whereas at almost every other colliery whitewash was used. The ponies at Langwith only had a short life of about 2½ years whereas the lifespan of ponies at neighbouring pits was 5 years. They cost about £22 7s 6d (£22.37½p) on average. Fred Bowler was the horse keeper at the turn of the 20th Century and lived in the pit yard. He had a large family of 9 children and there were 3 generations named Newton who were ostlers or stablemen. Coaling from Top Hard pit bottom until 1934, when insets were made at High Hazels horizon. 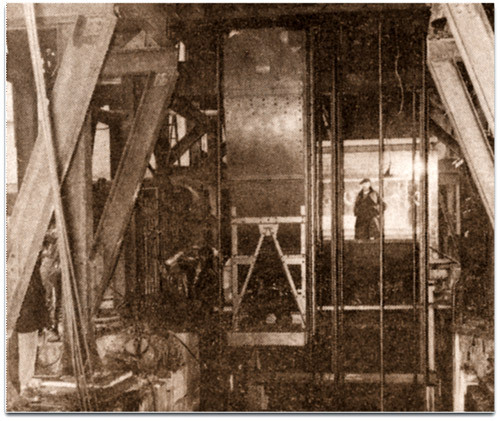 No1 DC shaft had cages with 3 decks and a balance rope with two 10 cwt tubs on each deck, later increased to 17 cwts and they were loaded and unloaded simultaneously at separate levels. The steam winding engine was the vertical type with 2 cylinders, 40” (1.01m) in dia with a 6 feet (1.8m) stroke and parallel drum 20 feet (6m) in dia and 9’ 0” (2.74m) wide. The winder at the UC shaft had 2 horizontal cylinders 30” (0.76m) dia x 5’ 0” (1.52m) stroke and a parallel drum 14’ 4” (4.37m) dia x 11’ 6” (3.50m) wide had 2 deck cages with 10 cwt tubs. A balance rope was attached to the base of the cages to assist the winding engine by putting weight on the empty cage. Originally engines on the surface drove the haulage ropes underground with the ropes being guided down the shafts and diverted by pulleys. There were 2 fixed engines on the surface driving endless haulages underground. The one down the DC shaft had 2 horizontal cylinders 18” (0.45m) dia x 3’ 0” (0.91m) stroke, gearing 5¼:1 with a driving wheel of 8’ 0” (2.43m) dia. Down the UC shaft a similar engine with 2 cylinders 18” (0.45m) x 3’ 0” (0.91m) stroke with gearing 5:1 and a driving wheel 7’ 0” (2.13m) dia. An underground haulage engine and system costing £882 was installed. This was to relieve some of the burden of the pit ponies hauling coal from the working benks to the pit bottom. A Guibal fan 40’ 0” (12.19m) dia at 48 revs per min was driven by an engine with duplicate horizontal cylinders 36” (0.91m) x 3’ 0” (0.91m) stroke. But in 1880 the coal trade was not good as a levy was put on coal trains going to London. A certificated Manager Chas Beevers was appointed but he was blamed for the shortcomings of the colliery, however he was not replaced until 1888. 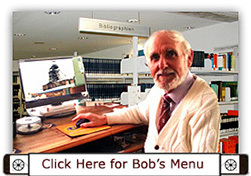 JB Smith the son of the Managing Director was appointed as Agent to sort out the problems. He moved on to Glapwell colliery in July 1884. Work on developing the infrastructure had been held up by adverse conditions caused by faulting. There were 2 major faults passing through the take one running North West to South East and another East to West just to the South of the shafts. By August 1883 the company had spent £40,000 on the colliery but now the production of coal was increasing and had ready markets, however it was thought that the men on the screening plant should have some protection from the weather and so covered accommodation was erected (at the minimum of cost). Electric lights were introduced later as it was seen that the coal was better screened. Electricity was introduced underground in 1896 produced by a dynamo driven by an engine from Nesfield colliery and by 1899 electric pumps was in operation underground. Other information gives the No1 shaft sunk 567 yards (519m) to Dunsil later, with a King’s improved Patent safety hook and No2 to Top Hard at 536 yards (490m) with an Ormerod Patent safety hook 1876/78, both at 14 feet (4.26m) dia. In 1873 Sheepbridge Co built 152 miners cottages North East of the village on land owned by Allen Alexander, Earl of Bathurst. The colliery take extended across the Nottinghamshire / Derbyshire border, however there were two major faults across the take. During the lockout of 1893 from August to November when owners required the miners to accept a reduction in wages because of lower coal prices and not to be allowed back to work until they agreed to those terms. This caused much hardship and the Duke of Portland gave hares and rabbits to families. No2 shaft cage (called Shonky pit) was enlarged in 1896 from one that carried 12 men to one to carry 20. The nearest houses in the pit rows were referred to as Shonky Rows. Coal was loaded out by screen or fork at the face as only lump coal was saleable in the early days. The Duke of Newcastle sent his traction engine regularly to haul coal back to Clumber for use in the house. In the 1890s a couple of steam driven locos were purchased for shunting work on the surface. The Midland Railway was connected to the colliery in late 1874 and in 1894 the LD and ECR (later named the Great Central Railway) also had a connection to the colliery. In 1919 the miners refused to work Sunday night shift and came out on strike in sympathy with the South Yorkshire miners who were pressing for a shorter day. In 1920 there was a further drop in wages as coal prices fell once more and there was a lack of demand. A soup kitchen committee was created which gave out umpteen gallons of soup and bread to children and others in the district. Two local butchers, Mr Lindley and Langwith Co-op gave out soup for 700. Other donations were received from other local people. 2,476 tons of coal was turned on Tuesday 18th December 1921 (Bull week) in two 7 hour shifts. 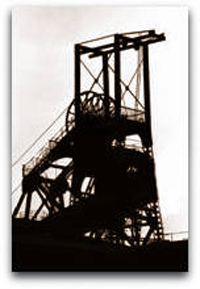 This was a record output for the colliery at the time and possibly a record for the Nottinghamshire / Derby Coalfield. During the general strike of 1921, although a lock out was in force some men were allowed to work the pumps to keep the water level down. Of course the general strike of 1926 from May to November for the first few days backed by the TUC fizzled out eventually, a disaster for the mining community, the men returning to work for more hours and less money, the very thing they had struck against in the first place. In the 1930s abortive attempts were made to produce oil from Langwith coal. Wages for boys starting work at the age of 14 were quite low as jobs near the pit bottom were allocated to them such as dogging on and lockering. By the age of 15 most of the boys graduated to haulage inbye releasing older ones to begin work at the coal face. It was continuous as obviously the higher wages were obtained at the coal face. Haulage rates started at 2s 9d (13p) a day and every 3 months would rise by 1½d (about ½p) until the age of 18 when the full wage was 9s 2d (46p) a day. Fillers were probably earning around 16s (80p) and a colliery Deputy 18s (90p) a shift. Pithead baths costing £21,000 were opened on 12th September 1931 and the land leased to the welfare for £3 per year. 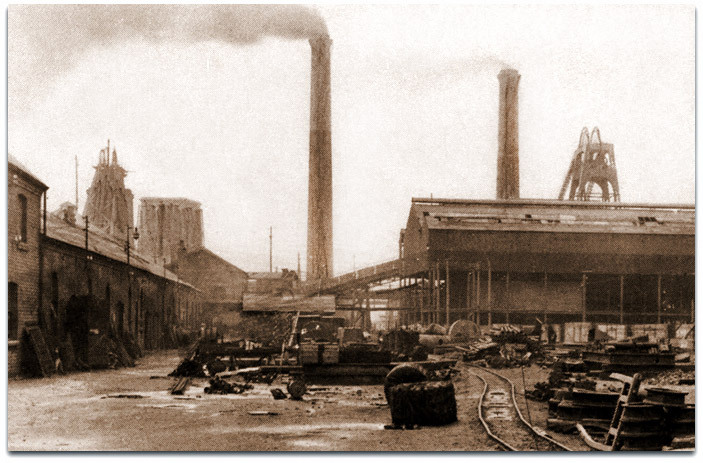 At the beginning of the Second World War 1939-45 around one hundred men were transferred to Glapwell colliery as the Top Hard began to be exhausted and doubts about the continuance of the colliery muted. However the High Hazel seam was opened and production carried on. In 1943 further insets made at High Main (Wales seam) horizon. Electricity was generated for use at the pit and during the War periods to Shirebrook also. When the mines were nationalised from 1st January 1947 the Sheepbridge Co were asked to continue managing the pit for a further 6 months to allow re-organisation at some of the nearby pits. Power loading in the form of Gloster Getters was introduced in the High Main in the 1950s. The covered screens completed in 1882 were extended in 1901. 7 tons Skips were installed at No1 shaft in 1956 to replace the tub system of winding, one of the first to do so. 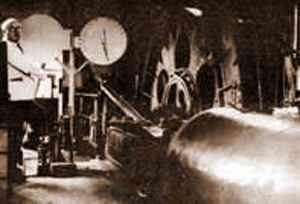 Handfilled system of coal production at the face was replaced by machine cut method. Powered supports introduced in the Main Bright 1961 and Clowne (developed 1962/63 from Main Bright) in 1966 with shearers and double ended conveyor mounted trepanners (DECMTs). A new coal prep plant was commissioned in Nov 1964. It had been planned to build a Lurgi gas plant at Langwith in 1961 but the plans were shelved and a plant was built at Wingerworth instead. The steam winders were electrified in 1961 and 1963 and the main fan in 1966. No2 shaft was filled to the Main Bright level. A new coal washing plant was commissioned on 17th November 1964.